The Nature Trail - Stop No.1. Hedges are often taken for granted by most people but a careful study can reveal much. 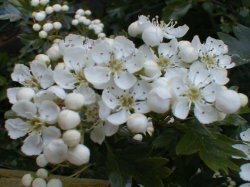 Firstly determining the age of the hedge, as a rough guide count the number of hedge species established in your hedge in a 100m length and multiply that number by 100 to give the age in years of the hedge. Modern hedges tend to have just hawthorn as it is very quick growing but an older hedges such as this can have many different species of plant. Having paced 100m count the species here we have, hawthorn, blackthorn, holly, elderberry, and hazel. Therefore using the rule of thumb above - counting 100 years per species - we can say our hedge could be around 500 years old! 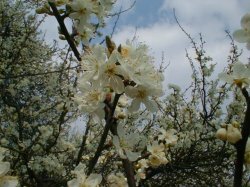 The most common type of hedging in Cheshire shown here in flower the scent from which can be quite strong in the spring. 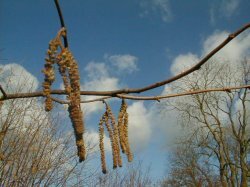 During the autumn it will provide a berry feast for the wildlife. 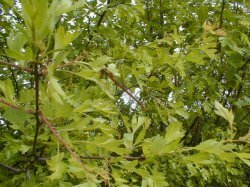 Hawthorn is actually a tree. Earlier flowering than hawthorn with less scent this is a relative of the domestic Damson fruit. Its fruit are called sloes, these are picked and used by some people to make liquors such as "sloe gin". 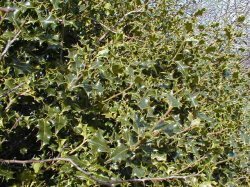 Often found in peoples gardens holly makes a very stock proof Hedge, however it is too slow growing for most farmers. Known for its flowers and berries which can both be used to make drinks it is regarded as a nuisance plant. 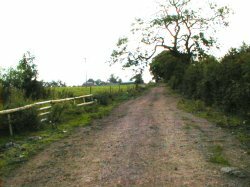 This is mainly due to the fact that its stems are weak, and it leads to gaps appearing in the hedge when cattle nibble at it.